Haynesville Play: The Haynesville Shale Resource: Eureka! I had my Eureka! moment when I opened my Wall Street Journal this evening to see a two page full color ad spread from the natural gas lobby touting natural gas as "cleaner, smarter energy." Then I saw a "clean coal" ad on TV by one of the tentacles of the coal lobby and felt ill. 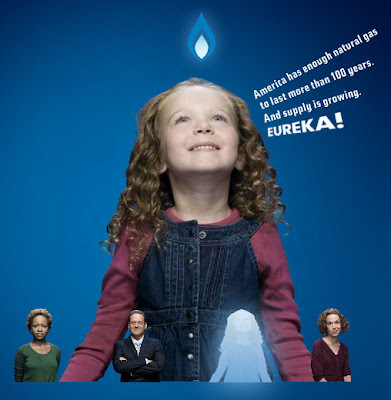 The ad campaign is part of an advertising and lobbying blitz sponsored by the American Natural Gas Alliance (AGNA) to lobby the U.S. populace and lawmakers in advance of the energy policy debate. The campaign is led by the ad firm Grey (here is a quick article about the campaign and the other mercenaries working on the campaign). Check out the web site newnaturalgas.org.